The 2019 GMC Sierra offers far more than just the ability to haul with a truck bed. The new model year Sierra has been released at the Chris Auffenberg dealerships near Cape Girardeau, MO and it's packed with performance-focused features, convenient amenities, and a brand new exterior design that offers more room in the bed and cargo area than ever before. Learn more about all of the changes and updates that the 2019 GMC Sierra received for the new model year below. While the 2019 GMC Sierra has grown larger in length and width to accommodate almost 3 extra inches of legroom in back and almost 7 extra inches of room in the bed, the whole vehicle actually weighs more than 350 pounds less than outgoing models which is helpful for performance and fuel economy. The 2019 Sierra was also upgraded with features not found on a pickup truck model before like an available head up display and available rearview mirror camera system that allows drivers to see a complete view of what's behind them even when the back is filled with passengers or taller items. A brand-new MultiPro Tailgate system is available to help tackle cargo bed storage solutions. Six new configurations allow for a mobile standing workstation, second-tier storage options, and more. Enhanced cargo bed lighting, 12 cargo tie-downs and larger CornerStep openings round out the features added to the 2019 Sierra's truck bed. 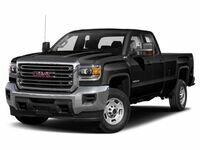 In addition to the original active safety offerings on previous GMC Sierra models, the 2019 Sierra adds a traction control system with selectable drive modes, Lane Change Alert, Side Blind Zone Alert, and GMC's Surround Vision. For more information on all of the new features and offerings on the 2019 GMC Sierra, visit your local Chris Auffenberg GMC dealership. Chris Auffenberg GMC dealerships include the Auffenberg Carbondale Buick, Cadillac, GMC dealership in Carbondale, IL and the Auffenberg Chevrolet Buick GMC dealership in Farmington, MO. Interested in a 2019 GMC Sierra?